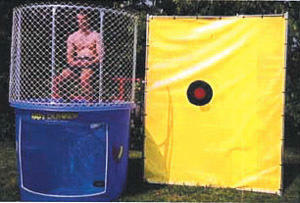 Dunk Tank Dunking Booth - Great fun for family, company, school, church and promotional events. Dunk tanks and dunking booths have been delighting crowds of all ages for years! The concept of dunking the boss at the company picnic, or that local "celebrity" at fundraising events has become an American pastime. If you can throw a softball, then you can "dunk the chump" into 500 gallons of water! CAPACITY: Can accommodate 1 rider and 1 player at a time (many spectators). An adult MUST be present at ALL TIMES while unit is in use.